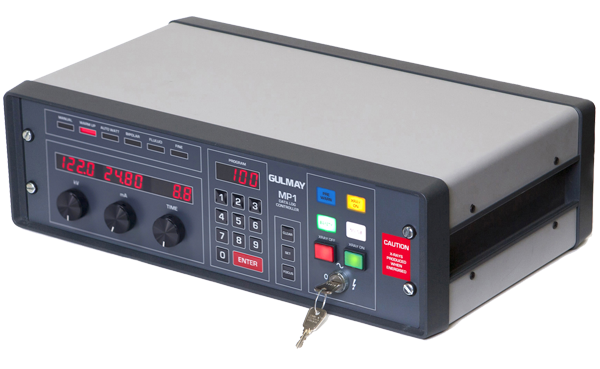 The Gulmay MP1 Controller is a microprocessor based controller designed for use with Gulmay high voltage X-ray generators. Available as a 19″ rack-mount unit or as a stand-alone controller, the MP1 is factory programmed for use with over 110 x-ray tubes. The MP1 provides dedicated control of all generator functions through a rugged front panel designed to withstand the harshest of operating conditions. Large, bright LEDs provide clear indication of kV, mA, time and system status in both light and dark ambient environments. An RS232 interface provides constant system monitoring and PC control. The MP1 constantly monitors generator status and interlocks to provide the highest degree of system safety and reliability. Tube software data is fully controlled by Gulmay, ensuring quick and straightforward integration of new and modified x-ray tube specifications. Please fill out this form if you would like more information about the MP1 Controllers.